It was 12 F when I left my house on Wednesday morning, and that was before wind chill. While it has warmed up considerably since then, I can still say with absolute certainty that not only would I like to still be on vacation, I’d really like to be back in the 85 F sunshine of the Caribbean. Let me back up. In a novel turn of events my parents and I spent Christmas on the marginally obscure Caribbean island of Curacao (yes, like the liqueur). Why, you might ask, did I go to an island most people in the US have never heard of . . . . did I mention the 85 F sunshine? Actually, I had a better reason than that (although currently I’m inclined to think that 85 F is its own reward – I found myself unironically describing 26 F as balmy earlier this week). 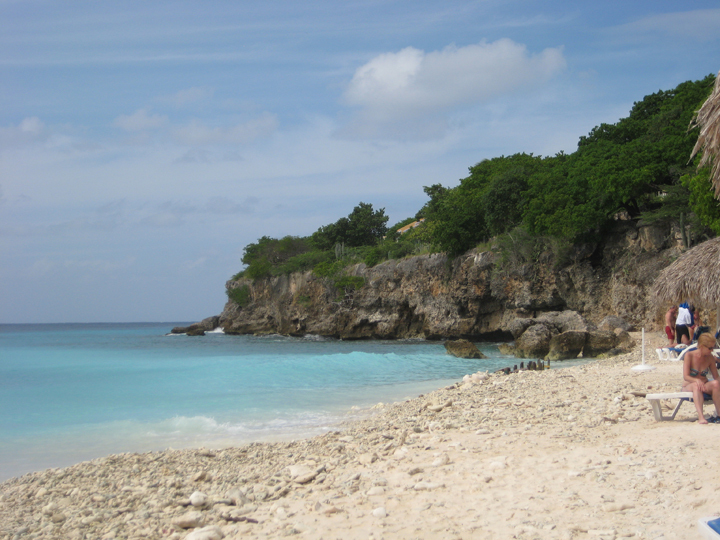 The better reason is that when my father was a teenager he lived on Curacao for several years. This was back when Curacao was on the far edge of nowhere as far as anyone in Europe was concerned, there was a mail boat that arrived sporadically and the entire island turned out to see it come in to port (and find out what packages it was carrying). He went back in the ‘90s for work and was pleasantly surprised by how the island had developed, and preserved its past. My mother and I have always wanted to visit but it never seemed to work out until this year. I think there is a magic age when you are about 13-15 when wherever it is you live becomes home for you in a way that nowhere else has been before. You’re old enough to go exploring on your own and find your own secret favorite places (even when they’re massive public spaces) and that you love for reasons that are entirely your own and have nothing to do with your parents or friends or siblings. 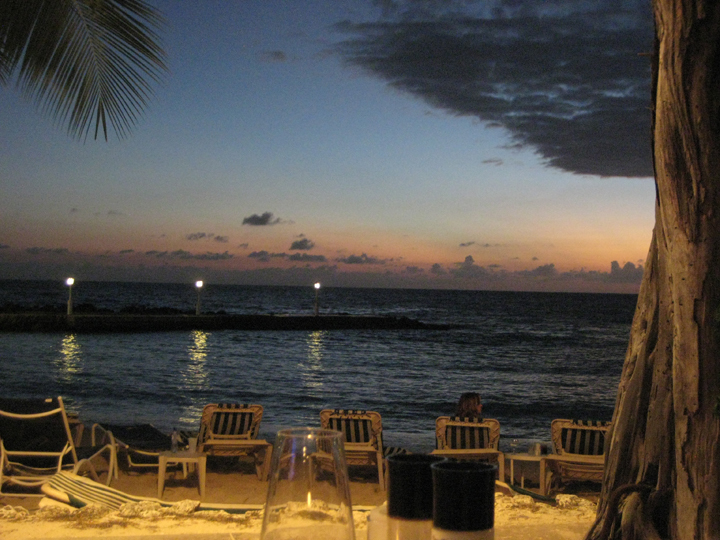 For me that place is Paris, for my father it turns out that place is Curacao. It was really lovely to have a chance to see the places where he lived, and went to school (some of which have aged better than others), and hear stories not just about living there in the ‘50s, but also about just growing up there. Most people in the US are more familiar with Aruba – as witnessed by the fact that there’s a direct Jet Blue flight from Boston to Aruba, and there’s an entire terminal at the Aruba airport devoted to US bound flights (downside – once you enter it’s like you’ve ended your vacation early and are back in the US; upside – you clear customs in the tiny airport of Aruba and therefore get to skip the tedium of doing it in the much larger airport of Boston). 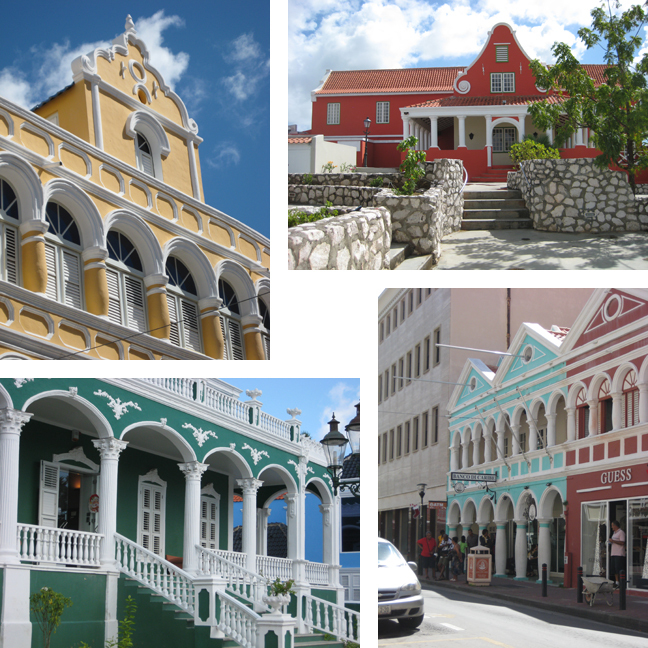 However, if you’re Dutch, you’re probably more familiar with Curacao – as evidenced by the daily direct flights from Amsterdam. Oddly both islands (+ Bonaire) are Dutch historically and currently (in some convoluted way that neither my parents nor I could ever fully parse). Landing in Aruba this is not obvious since all signs are in Spanish, and the airport is in fact called the Aeropuerto Internacional Reina Beatrix. Curacao, on the other hand, is emphatically Dutch, from the hagelslag (don’t knock it until you’ve tried it) and krentenbrood in the supermarkets, to the kroketten broodjes on every lunch menu (I prefer them in bitterballen form – but they are tasty in that way that deep fried things are usually tasty). 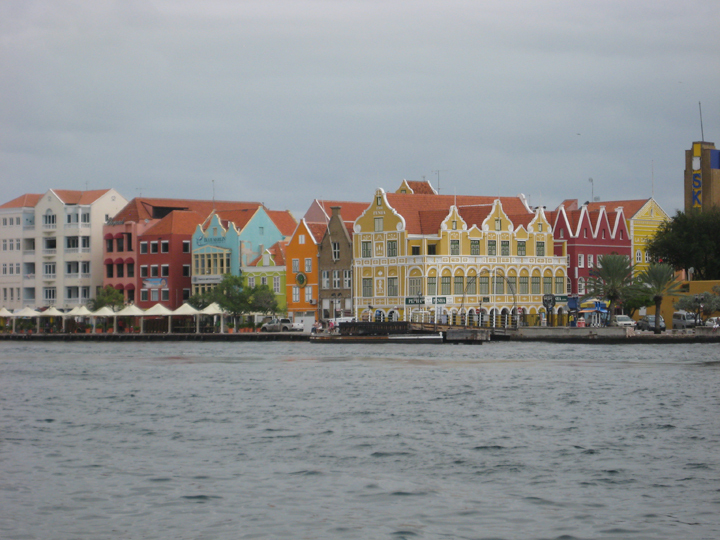 Curacao (and Aruba and Bonaire – collectively and imaginatively the ABC Islands) was originally settled by the Spanish at the very end of the 15th C who promptly enslaved the native population, but never fully appreciated the island itself because it suffered from a lack of gold and an easy supply of fresh water. The Dutch West India Company (WIC) conquered/inherited/took over the island in 1634 and unlike the Spanish realized the strategic and commercial potential of an island with an enormous defensible deep water harbor. For context the Schottegat (the internal bay) is large enough to house an oil refinery, the largest dry dock in the Western hemisphere and a naval station without looking crowded. 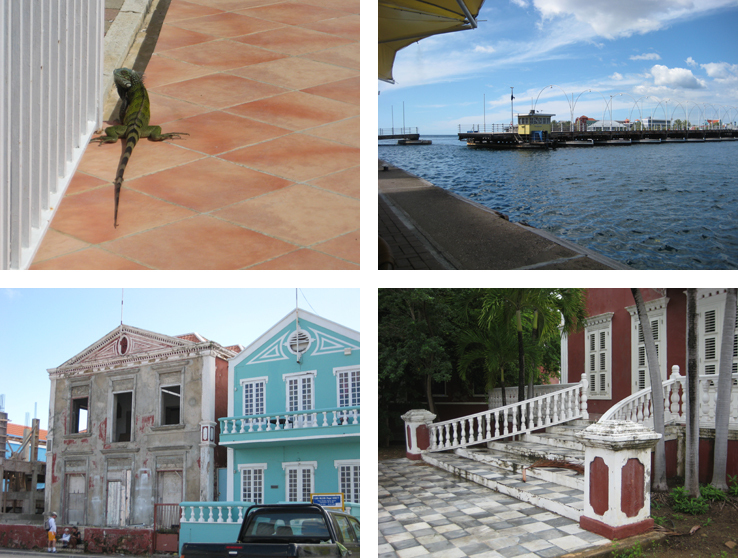 It’s also only accessible by a narrow channel where the WIC cleverly built a town – now the capital of Willemstad – to protect and oversee access to the harbor. 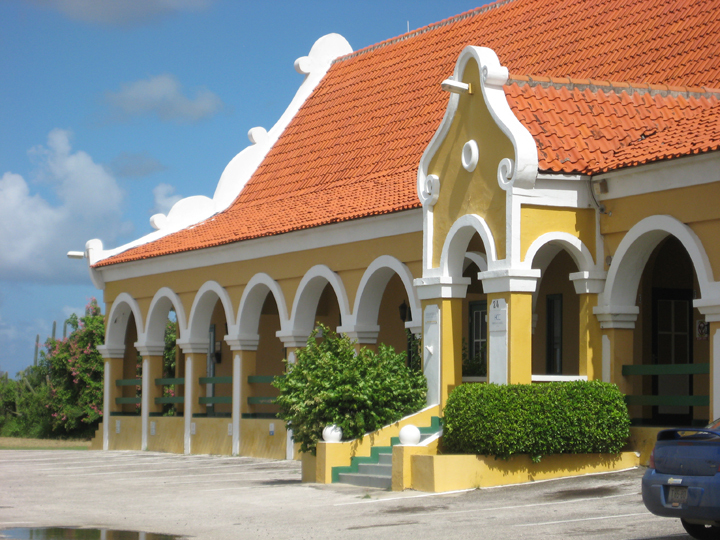 The West India Company turned Curacao into a nexus for the slave trade – the Curacao Maritime Museum engages in some entertainingly revisionist history and assures the visitor that while the slave trade was obviously a tragedy and a scandal, but that if you had the misfortune to be on a slave ship you wanted to be on a Dutch slave ship because the Dutch transported fewer slaves at a time and took pains to keep the ships clean. 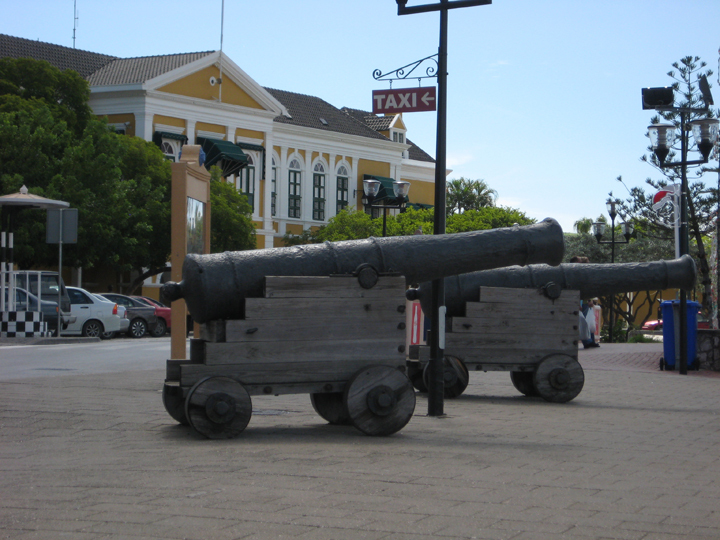 Along with the slave trade Curacao became, as all good Caribbean islands should, a nexus for trade and piracy. It changed hands between the French and the English a few times during the Napoleonic Wars before reverting to Dutch rule in 1815 under which it has remained ever since. Currently the island engages in some oil refining, a lot of financial services, and tourism. 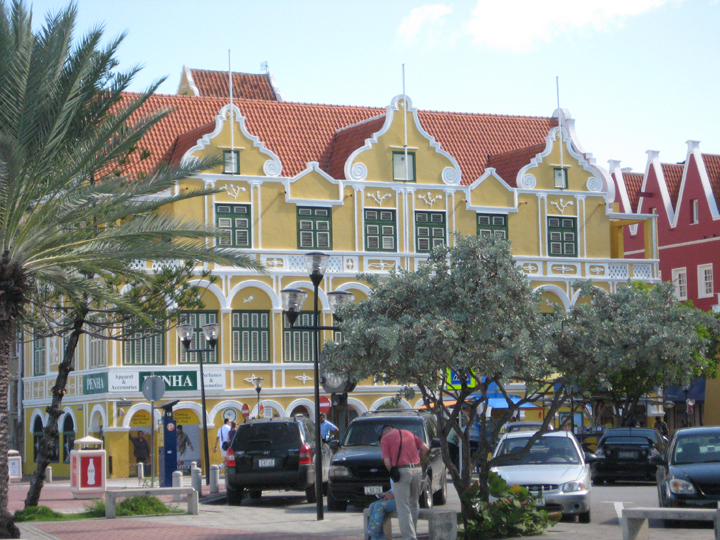 It has some sun and sand tourism – the calmer south side of the island has beaches and coral reefs and the windier north side of the island has some good wind surfing, but unusually for the Caribbean it also gets a lot of cultural tourism because Willemstad has been on the UNESCO list of World Heritage Sites since 1997. Technically the architectural style of the island is known as Dutch Baroque (or at least that’s how local historians refer to it). I think it looks like you took a row of Amsterdam canal houses and decided to build them out of fondant and royal icing. They are gorgeous ridiculous confections of buildings in a rainbow of cheerful colors. Apparently originally all the buildings were white washed until they realized that the sun reflecting off the blue Caribbean sea on to all white buildings was blinding the population and causing massive eye strain at which point the governor ordered everyone to paint their houses. This not only cured the island’s collective migraine, but also resulted in a charming waterfront. There’s been a lot of restoration of the old town houses which have been turned into shops and government buildings in the downtown area, and office parks and restaurants in the suburbs. Sitting at my desk in the 1960’s monstrosity that is my office building (it’s not as bad as Boston City Hall, but it’s in the same vein), I feel keenly envious of anyone who gets to go to work in a building that looks like this instead. Further out on the island there are the old landhuisen – the homesteads of small plantations (the island’s not big enough to have large plantations). Not all of them have been restored, we certainly drove past a number that are still awaiting their turn, but a lot of them have been, and are now restaurants (we ate Christmas dinner in an old restored landhuis), and museums, and some of them are even still private residences which is the kind of thing that always blows my mind a little. In between sunning ourselves on beaches, gawking at restored and unrestored home,, and visiting my father’s old haunts, we also had time to go out for a very nice dinner at Landhuis Classics on Christmas Eve, observe some local wildlife up close and personal, and take an egregious number of pictures of the Queen Emma pontoon bridge opening and closing to allow tankers, cruise ships and the occasional flashy Coast Guard boat to enter and exit the Schottegat. All in all, a very good time was had by all. If you’d like more proof, I took an egregious number of pictures during the ten days I was there. Whole gallery is located here. In much the same way that Malta acquired a disturbing fondness for mushy peas from 150 years of British occupation, Curacao inherited a taste for erwtensoep from the Dutch despite the year round 80+ degree weather. I quite like erwtensoep, and grew up eating it, but declined to indulge in a bowl while sitting under a palm tree wearing a tank top, even if it was December. However I’m back in Boston now and a bowl of erwtensoep feels a great deal more appropriate. This is not the erwtensoep I grew up with, it’s more of a deconstructed homage to that erwtensoep than anything else. 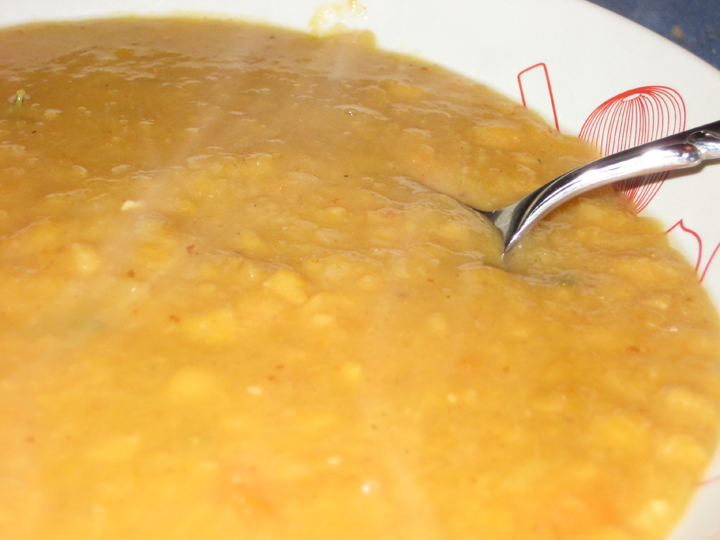 For one thing I used yellow instead of green split peas – the taste difference is negligible, but they result in a gorgeous cheerful sunshiney yellow soup (although it takes a very boring picture). For another thing, this soup is spiked with Indian flavors in the form of coriander, lots of fresh ginger, and then finished with a bright hit of lemon. 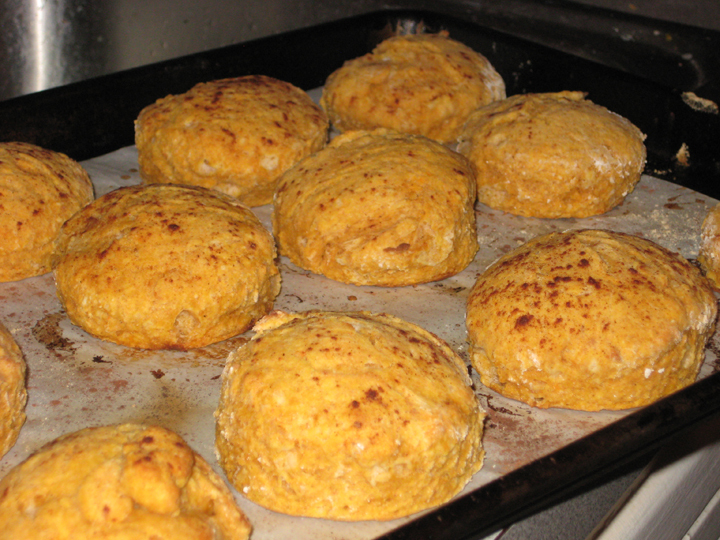 And, finally, I’ve moved the ham from the body of the soup to the side of the plate tucked inside a sweet potato biscuit. Toast the ground coriander in the pan until fragrant (about 30 seconds). Add the olive oil and sauté the garlic, ginger, onion, carrots, celery and leeks until tender. Add the split peas, rosemary, bay leaf and 4 cups of liquid. Bring to a boil, cover, reduce to a simmer and cook for 60-90 minutes until the split peas are tender (you know you’ve cooked them long enough when just stirring the soup more or less purees the peas – you want it creamy, but with some texture). Season to taste with salt, pepper and lemon zest and juice. Add more liquid if necessary to thin to the desired texture (I ended up adding nearly the entire extra 2 cups of liquid). Note: Don’t add the salt and pepper until after your split peas have cooked. If you try and season the soup before the split peas have cooked through they will never get as tender and creamy as if you wait. Also, when you reheat the soup (either because you made it a day in advance, or because you’re eating leftovers) be sure that you stir it frequently. The thick puree of the peas has a tendency to sink to the bottom of the pot and start to burn on the bottom if you don’t. I forgot to measure the cooked sweet potatoes (again), but I did manage not to burn the bottoms of the biscuits this time. 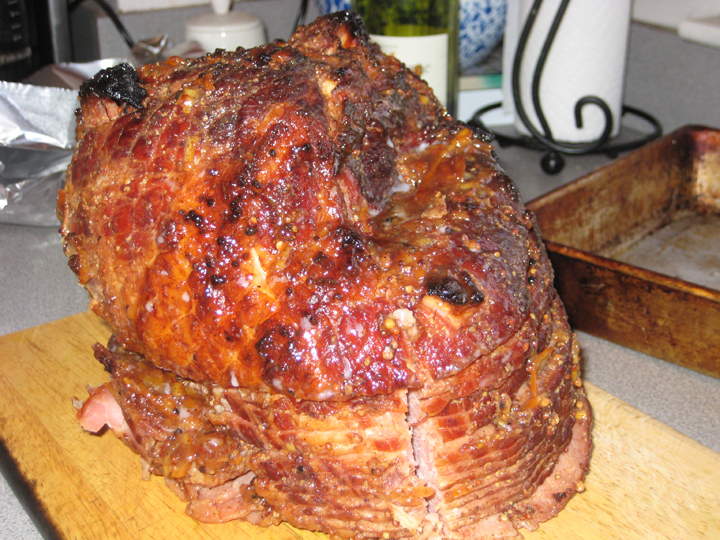 For New Year’s Eve I indulged myself and cooked an 11 ½ lb spiral cut ham (and by cooked, I mean I stuck it in a warm oven for several hours to reheat – the effort to pay off ratio on a spiral cut ham is wildly in your favor). We did our best on New Year’s Eve and made our way through a significant chunk of the ham, but come New Year’s Day there was still a hefty amount leftover. This was an entirely deliberate calculation on my part and if we hadn’t had enough leftover I would have been forced to go buy more ham from the deli counter to have for Dinner. Fortunately that wasn’t remotely necessary because while all ham is tasty, this ham was spectacular (although still not as good as a Virginia ham – one day I will do a whole ham dinner). I carved up the rest of the ham for Dinner and stashed the bone in the freezer for future soup use. At the end of the night there was just enough ham for a few sandwiches and to put on top of a ‘pizza’ (with pumpkin sauce and apple slices) on Sunday night. I bought chestnuts on whim for New Year’s Eve, but didn’t end up making them then because there was so much food on the table that it was wildly unnecessary. I made them for Dinner instead (where, to be fair, they were also wildly unnecessary) and ended up introducing them to almost everyone at the table. It hadn’t really occurred to me that nobody else would have had them before because I grew up buying roasted chestnuts from street vendors first in New York (when we would go in for the Christmas windows), and then in Paris and Geneva (all winter long), and lately in Avignon (when we go to the Christmas market). However, I think almost nobody at Dinner had ever had them before, and on reflection I don’t think I’ve ever run across them being sold in Boston. Now that I know how easy they are to make at home I think I’m going to indulge in roasted chestnuts more often. The homemade version lacks the romance of walking around with a paper twist of piping hot chestnuts on a crisp winter’s day. On the other hand, this is not a romance that’s apparently available in Boston and I’d rather have prosaic homemade roasted chestnuts than atmospheric, but unavailable, ones. Cut an X into the top of each chestnut with a sharp knife, making sure you slice through both the hard outer shell and the papery inner shell (the hard outer shell so they don’t explode when you roast them (really), the papery inner shell because it makes them easier to peel later). Try not to cut too deeply into the flesh of the nut (this is easier than it sounds, really). Toss with the vegetable oil. Heat a large heavy skillet (ideally a cast iron skillet) over a low to moderate heat and then add the chestnuts. Cover with a lid and cook for 15-20 minutes, shaking occasionally. Add the water and allow to steam/cook for a further 5-7 minutes until the nut meats are tender. If you have leftovers peel them and store in a ziplock bag in your fridge. You can either snack them straight out of the bag, or you can turn them into soup, put them in stuffings, risottos, sauté them with Brussels sprouts . . .
As a side note, chestnuts are significantly easier to peel when they’re warm than when they’re cold, so if you’re roasting chestnuts to use as an ingredient in something (as opposed to just because you want to eat roasted chestnuts from the shell) don’t let them cool before you peel them. Making one’s own hagelslag! I cannot conceive of a time that I would be so sprinkle-deprived that I would do this. But I am confirmed in my impression that if you can’t find it on the internet it does not exist. And I would love to visit a hagelslag factory to see this stuff being produced.